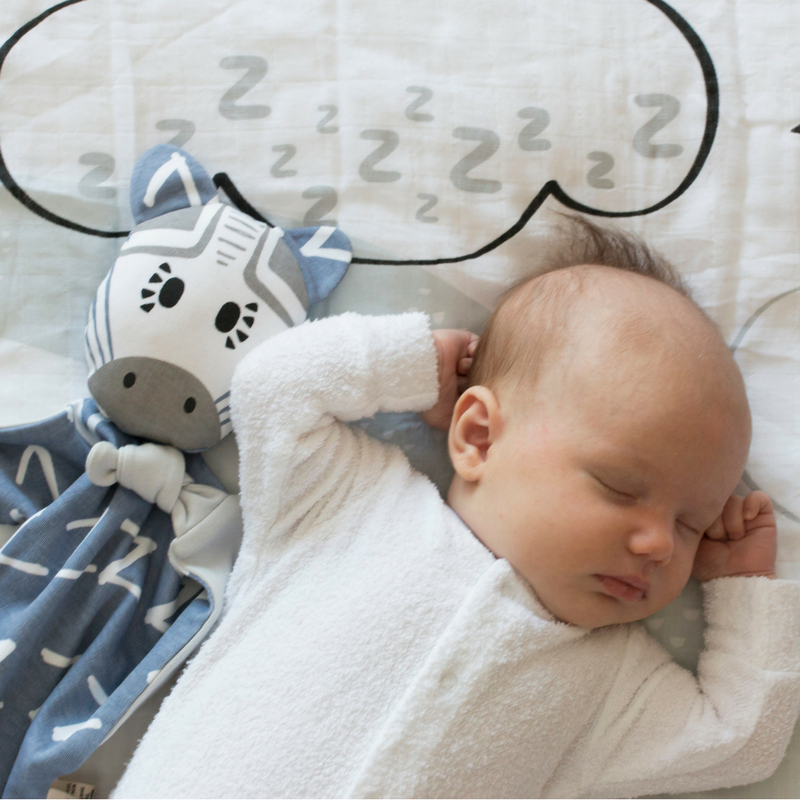 It's a fact supported by Sleep Consultants all over the world - babies and children settle and sleep better with a cuddle blankie. Introducing the Kippins Comforter Cuddle Blankie the BEST baby comforter - a tribe of best buds, made for squeezing, hugging, and good times - perfect for sleep, comfort and play. - This "Mum-approved" sleep comforter for babies is inspired by nature, storybooks and wild imagination. - Each Kippin has been designed with a simple, graphic print - a high contrast pattern that babies love! No two Kippins are exactly alike. - By repeatedly introducing a baby to a comfort object, an attachment is formed. The special touch and smell of their comforter makes little ones feel relaxed and secure and contributes to positive emotional development, providing a sense of security when parents or caregivers can’t be there. - Gentle on skin and planet friendly, made from the softest 100% organic cotton and hand printed using organic ink. - Machine washable/tumble dry and safety tested in Australia to use from birth. - Each Kippins' arms and legs can be tied and looped through a dummy, so the dummy doesn't get 'lost' in the night. - We recommend washing your Kippin Cuddle Blankie prior to use, and wearing the Kippin inside Mum or Dad's shirt for a few hours, to get that familiar smell that little ones find so comforting. - And a spare is a great idea too! - It's a good idea to buy 2 of your favourite Kippin design, in case one accidentally gets lost or dirty. - Parents often find that a Kippin becomes the go-to in times where they need baby to be settled or relaxed – sleep time, nappy changes, car rides, doctor’s visits. - They’re also great for including in games – developing motor skills, learning about size and dimensions, and imaginative play. - At age 3 or 4, most parents will find their child is still in love with their comforter, so it’s worthwhile making it a special friend that will grow with them. - Kippins Cuddle Blankies are Australia's most popular organic comforter, designed and owned by a Brisbane based family. They are now stocked in over 17 countries. Kippin Comforters have been safety tested and approved for use from birth. This test is conducted whilst the baby is awake. SIDS and Kids guidelines recommend leaving your child's face and head uncovered. The Kippins can be part of the bedtime routine and can be removed from the cot once your baby is asleep. If at anytime you have concerns about the use of a comforter, please remove it from the cot. The colourful Kippins Range is the perfect new baby gift - something they will love and use everyday! A great source of sensory comfort to little ones - especially when teething. Plus babies come to love the distinct smell of their Kippin buddy. - Children of all ages need good sleep, full stop. - Babies and children have better brain function, better mood and better physical capability if they have had sufficient rest. - Parents also need good sleep, if they are to positively attend to all that is required for a happy family life. - With that in mind, each family has there own routines and ways to comfort and settle their little ones. - Including a Kippin as part of a bedtime routine makes it a signal for sleep. - Soon, baby learns to fall asleep with their Kippin Cuddle Blankie, without any help from parents or caregivers. - They can also help the transition away from a dummy, providing something safe for sucking and chewing on that does not affect teeth or jaw development. - Thank you for understanding that Kippins are not a 'magic overnight fix' for settling/sleep issues. - Like any positive sleep association, it requires commitment and consistency. - But the long term benefits will be worth it. - Whatever stage of childhood your family is in, Kippins and the whole Snotty Noses range of sleep products can help. 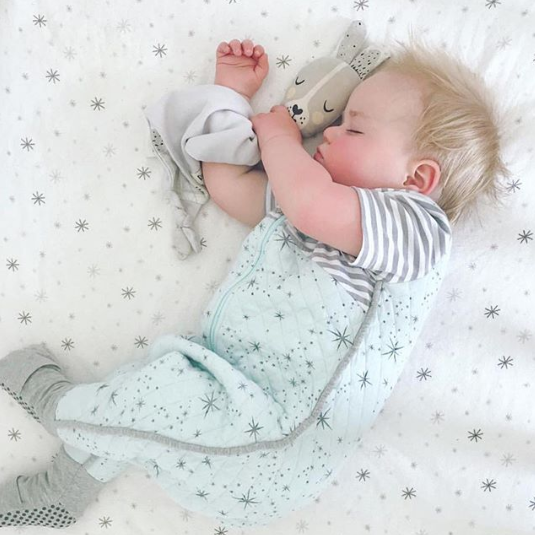 - From babyhood, children can be encouraged to develop healthy sleeping habits with the use of a 'white noise' sound machine, a night light and a comforter. - These independent baby sleep aids become a familiar, soothing cue that sleep time has arrived. Beyond babyhood, if habits have crept into your family's routine that you would like to change (eg: children sleeping in parental bed, child only soothing if parent lies beside them, child needing to be rocked or fed to sleep, child waking at dawn), then you will need to understand that it will take days or maybe weeks to re-train these habits. It may be a case of 2 steps forward, and 1 step back. There will be times it feels too hard or stressful or not worth it, but hold firm. In the long run, it's your child's health and wellbeing, and your energy and fulfillment as a parent that will benefit. That sounds like it's worth playing for! Your Kippins Comforter will be lodged with Australia Post or www.sendle.com Courier Service on the same day (if ordered by 10am EST) or on the next business day, GUARANTEED. Standard delivery - $7.50. Express Post - $10 or spend over $150 for free standard delivery. Why not buy a couple of spares, in case your favorite Kippin bed buddy goes missing or is in the wash! Buy 2 or more, and save an extra 5%, automatically calculated at the checkout! Same day, local pick up is available from Woolloongabba, Brisbane. 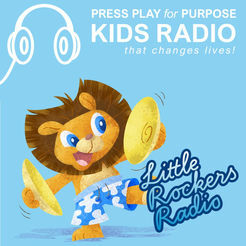 We have used this product with our own children, and they love their Kippins buddy. We love to hear the feedback from customers, who say this product has contributed to a calm bedtime and positive self-settling sleep patterns. Kippins are a high quality, trusted product, and will be loved by your child for years to come! Read the testimonials below. Availability: IN STOCK - Standard Delivery: $7.50. Express Delivery: $10. Spend over $150 for free delivery. Free local pick up available in Brisbane.